Thank you for making the first week of our 2015 Membership Drive a great success! Today, I would like to tell you about some of the most important initiatives we have planned for 2015. Please read on – or visit our 2015 Membership Drive page to learn more. One of our highest priorities for 2015 is to conduct a “finite element analysis” of WTC 7. Working with a structural engineering professor from a major university and a committee of peer reviewers composed of renowned leaders in the engineering field, the goal of our computer modeling will be to demonstrate conclusively that NIST’s collapse initiation mechanism for WTC 7 could never have occurred, and, secondly, that the destruction we actually saw can be more easily and accurately replicated by simulating a controlled demolition. 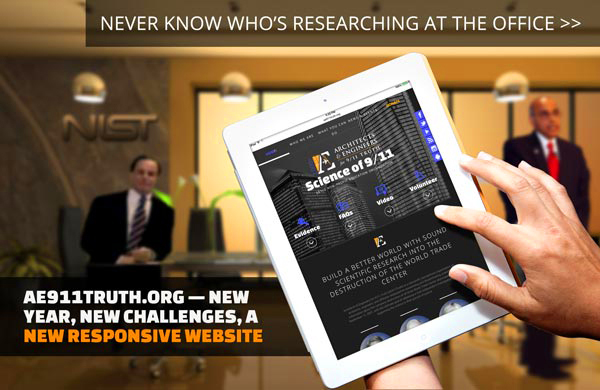 Once completed, this team of researchers will seek to publish their findings in top engineering journals, thus widely disseminating this critical information to a key community that continues, inexplicably, to be mostly unaware of WTC 7’s destruction. If successful, this study will awaken the entire engineering community to the truth about WTC 7 in a short period of time, and serve as the foundation to finally undermine NIST’s fraudulent reports in eyes of the world! In addition to computer modeling, we plan to ramp up our publishing activities with monthly briefs critiquing the NIST investigations and exploring in detail particular aspects of the WTC evidence. We also plan to publish Fran Shure’s illuminating series of articles, “Why Do Good People Become Silent—Or Worse—About 9/11?” as a book – ready for this year’s 9/11 anniversary. As part of our new website, we have reorganized our Evidence section to include many of the technical articles AE911Truth has published in the past. Look for this section to grow considerably in the coming year. Our ability to carry out these new initiatives while continuing our existing programs depends on how much we can grow our financial foundation over the next three weeks. For just a few dollars each month, you can be an integral part of allowing this work to happen. Please take the small leap and join us now as we strive to accomplish even more in 2015.